Kind of expected but still a bit of a surprise. 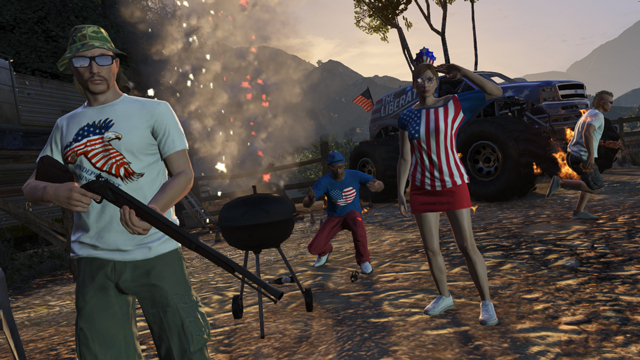 The Independence Day Special starts today featuring new USA-themed clothing, vehicles, and more! Check out all the goods and get ready to scream 'merica! over and over again! 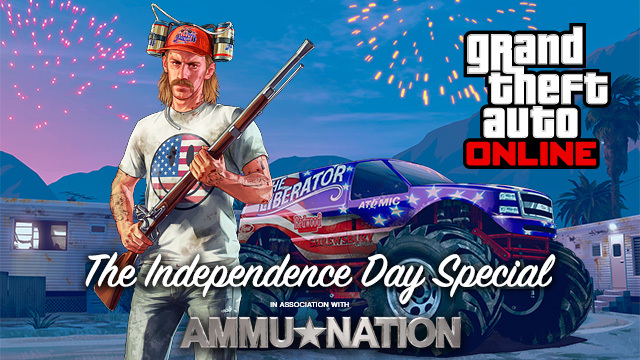 From Paleto Bay to the Port of Los Santos and everywhere in between, it’s time to celebrate the birthplace of freedom with The Independence Day Special (in association with Ammu-Nation) for Grand Theft Auto Online. 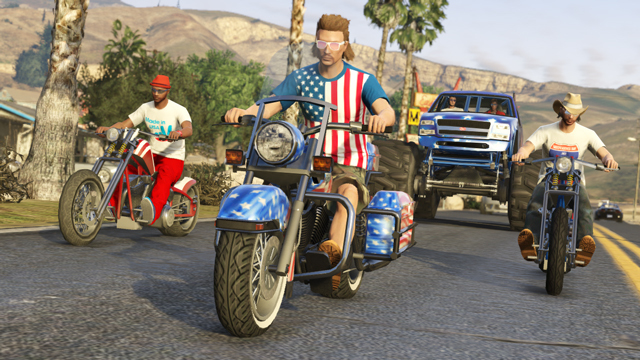 Demonstrate your exceptionalism and own the road from sea to shining sea with two new star spangled rides, the Sovereign motorcycle and the super-sized Liberator monster truck. And protect your rights the same way our Founding Fathers did with the latest addition to Ammu-Nation's antiques collection, the high-powered Musket... or channel your inner Jack Howitzer with the spectacular Firework Rocket Launcher. This special seasonal content will be available to redeem in-game until Mid-July (specific expiration date soon). The automatic update for the Independence Day Special also includes additional game tuning updates and other adjustments, including the new On Call Matchmaking function. This new option allows players to accept a Job invite and continue playing in Freemode until that Job fills up, reducing time spent idle while waiting for a Job to start. 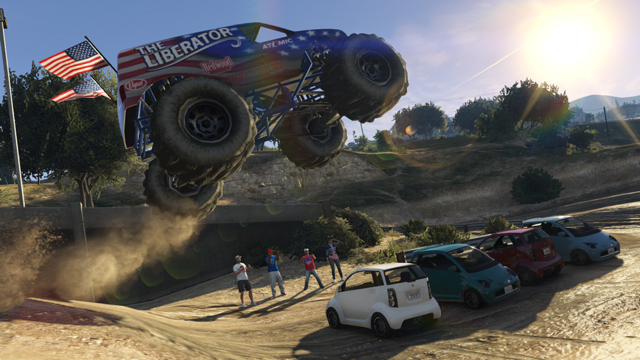 For the complete list of all the fixes and tuning updates, visit the Rockstar Support site. Look for details about the upcoming celebratory 4-day Independence Day Weekend Event tomorrow. Enjoy and join the chat in the forums! The limited time items will be coming off the market before the end of the week (likely Thursday, July 31st). You shouldn't take rumors as fact. What happened to the military vehicles that were allegedly supposed to be in this dlc? I think it would be awesome if they made a black market website on GTA where u can buy exclusive weapons for players level 70 and above. 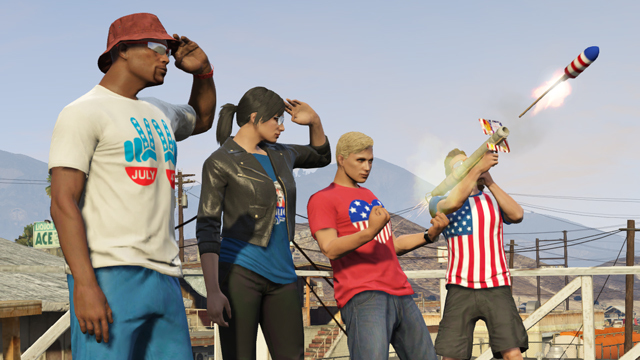 GTA Online Independence Day Special - Yet another surprise update to GTA Online: The Independence Day Special starts today!